Navigator Pro 7x50c is rated 4.6 out of 5 by 12. Rated 5 out of 5 by J Harry from Great optics and a exceptional company Navigator Pro 7x50c: The performance of this product compares very favorably with a friends other well known German Binoculars- very. Having used Steiner on my boat for the last 30 years and had them hold up extremely well and then having Steiner service them so professionally attests to the unusual quality and competence of this company. The auto focus is so nice while being bounced around a bit. Rated 5 out of 5 by Dolphin Hunter from The perfect marine binoculars The clarity of these binoculars is amazing, auto focus and a balanced and lighted compass, make these the perfect marine binocular. I added the padded, floating strap by Steiner and this puts these in a class of its own. This is definitely worth considering, as the value is outstanding. Rated 5 out of 5 by NutCrkrMD from Really great binoculars! I would have to say these are the best binoculars I've ever had. The clarity is awesome even at dusk. Really feels very sturdy. The compass works great! I just wished they added a floating strap standard. After all, these are marine grade binoculars. Rated 5 out of 5 by JadBird from Best binoculars I'll ever own Very clear,especially at night. I cant get over how well the auto focus works. The compass with red light is very stable and easy to read. I think the floating strap should be standard issue. They are too expensive to drop overboard. Rated 5 out of 5 by Pprosail from Essential to navigation I included the Navigator Pro 7x50c to the substantial navigation upgrades made on my 30' sailboat in the Puget Sound. They are an essential tool. I am very pleased with the optics and compass accuracy. Rated 5 out of 5 by BobD from Steiner is different Bought this pair about 15 years ago, and always loved them. I was completely unaware of the warranty when I called to see about getting the compass/light repaired. I was floored to learn they would fix it. No charge. They completely went thru my Navigators and shipped them to me in about three weeks. This is a company of great character , pride, quality. I will likely buy another pair to carry on on land. Rated 5 out of 5 by Crush from Best pair of binoculars I have owned. I have owned many different marine binoculars over my 31 years of professional life on the water. The Steiner navigators are a magnificent piece of work. They are rugged, submersible and have fantastic optics for the money. All backed with customer service that is knowledgeable, helpful and quick in response time. Thank you Steiner for making my job that much easier and enjoyable. Rated 1 out of 5 by jdv213 from Defective Purchased the Limited Edition 70 year anniversary version. Had to wait quite a long time for these and today they arrived, a day before I'm scheduled to depart. Took them out of the box only to find that the compass has a huge bubble inside making it completely unreadable. Will be returning it. Not impressed as I needed these for maritime guide purposes in the arctic this winter. 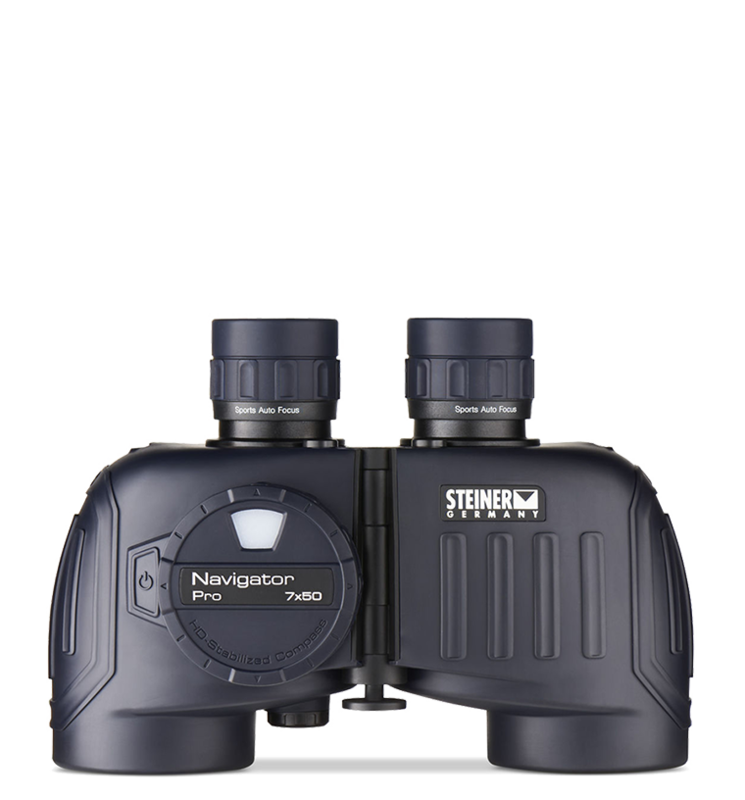 Is the Binocular Steiner 7X50 Navigator Pro waterproof and/or buoyant? The binoculars are submersible to 16ft, but are not buoyant on their own. The Steiner Floating Neck Strap is designed to float the weight of the binoculars. what models of stabilized binoculars do you offer? Our compasses are stabilized, but we do not make any image stabilized binoculars. What is the horizontal scale at the bottom of the view finder for? It is numbered from 0-80 with 40 being in the center. Compass and field of view. Hello, The compass is magnetic. Declination can be set on our Commander Global model. What waterproof floating strap do I need please for the Navigator Pro 7x50C? Item 7680/3 is what you need. I have a pair of Navigator Pro 7x50 with compass. The compass has a red light for night vision. Is there a way to see the compass in the daytime without having to use the red light to see the compass? Yes you can see the compass in the daytime. Is the Floating Neckstrap available as optional for the navigator pro 7 x 50 c? What is the IP distance? I need something slightly smaller than the standard&nbsp;56~74mm. The IP on these binoculars is the standard 56-74mm.